This website is intended to give a short introduction into the methods of the qualityTools package. The qualityTools package contains methods associated with the D efine (M)easure (A)nalyze (I)mprove and C ontrol (i. e. DMAIC) problem solving cycle of the Six Sigma Quality Management methodology. Usage of these methods is illustrated with the help of example datasets. which was made popular by William E. Deming but actually goes back to Walter A. Shewart. As part of the widely known and accepted Six-Sigma-Methodology some enhancements to this problem solving cycle were made and a problem solving cycle consisting of the five phases Define, Measure, Analyze, Improve and Control emerged. Define Describe the problem and its (financial) consequences. Interdisciplinary workgroups contribute to the problem and its consequences which is the pivotal stage in narrowing down the problem. Process flow diagrams identify crucial process elements (i.e. activities), creativity techniques such as Brainwriting and Brainstorming as well as the SIPOC technique should lead, depending on the future size of the project, to possibly a project charter. Amongst other things, the project charter serves as a descripition of the process, customer's requirements in relation to corporate objectives. Measure Come up with a reasonable plan for collecting the required data and make sure that the measurement systems are capable (i.e. no or known bias and as little system immanent variation contributing to the measurements as possible). Variation and Bias are the enemy to finding effects. The bigger the background noise the less probable are the chances of success using limited resources for all kinds of experiments. Within the Measure phase a description of the situation is given with the help of process- or gage capability indices i. e. Measurement Systems Analysis - Type I or a Gage R&R Measurement Systems Analysis - Type II . Analyze Try to find the root causes of the problem using various statistical methods such as histograms, regression, correlation, distribution identification, analysis of variance and multi-vari-charts. Improve Use designed experiments i.e. full and fractional factorials, response surface designs, mixture designs, taguchi designs and the desirability concept to find optimal settings or solutions for a problem. Control Once an improvement was achieved it needs to be secured, meaning arrangements need to be implemented in order to secure the level of improvement. Besides proper documentation, the use of statistical process control (i.e. 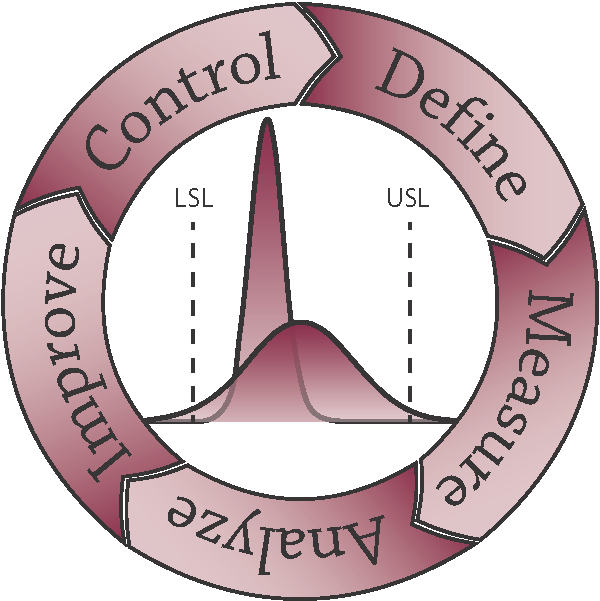 quality-control-charts) can be used to monitor the behavior of a process. Although quite often referred to as Show Programm for Customers, SPC is able to help to distinguish between common causes and special causes in the process behavior.